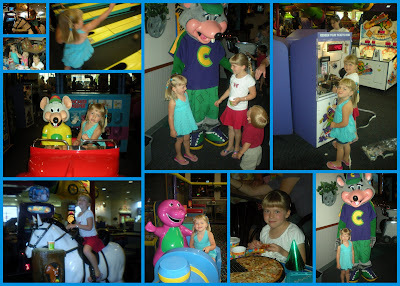 The Powers: Chuck E Cheese Birthdays! Our little friend Ella had her 4th Birthday party at Chuck E Cheeses! Never been a huge fan of parties there but my girls really love it there and always have so much fun! Haylee is very fascinated that there is a "real" Chuck E that comes around and will even shake your hand! Very Fun!! !